Now entering its 16th year, Miss Earth is celebrated as one of the Top 3 international pageants, featuring nearly 100 national representatives at each year’s glamorous competition. The winner of MISS EARTH TEXAS serves as the Ambassador to environmental protection campaigns statewide. 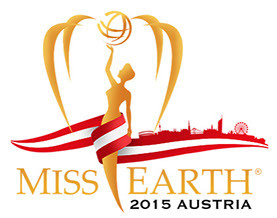 Just celebrating its Crystal Anniversary with the 15th Annual Miss Earth Coronation in Vienna, Austria, MISS EARTH continues to build its reputation as the most relevant and worthwhile beauty event in the world, setting a legacy of beauty and responsibility. 2015 MISS EARTH is Angelia Ong of the Philippines. 2015 Miss Earth United States Britany Ann Payne was named 2nd Runner Up and Miss Earth-Water. 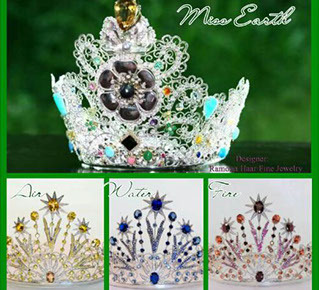 The current Miss Earth crown and elemental crowns were unveiled in 2009, when Carousel Productions commissioned the Official Jeweller of Miss Earth, Ramona Haar, an ecologically-minded artist. The design features various gemstones endemic to the countries participating in Miss Earth Pageant, which they donated as a symbol of cooperation and unity towards a universal goal of saving Mother Earth. The crowns are made of 100% recycled 14K Gold and Argentums Sterling Silver. The central design is a flower to symbolize a happy and thriving earth. As Ralph Waldo Emerson said, "the earth laughs in flowers." The recurring spiral motif, on the other hand, has always been associated with maternal power and feminine prestige. Black Diamonds, Sardonyx, Calcite, Ruby, Jade Quartz Crystal, Garnet, Peridot, and Pearls are some of the stones that adorn the exquisite Miss Earth crown.